We talked to the cowboy at the bottom of the hill and he pointed us up toward a shoulder below the ridge line. We wanted chukar, but more than that, we wanted Hungarian partridge. It was a winter day better than we had any right to expect, under blue skies, headed toward a high of 56 degrees. Scott Linden and I started up. Linden's two-year-old German wirehair, Manny, led the way. When Scott walked in, the bird rocketed out of the cliff wall. Scott swung, fired and the bird punched into the hill. Manny tracked it with his eyes and plunged after it. “Trust the hunter with the long nose.” Linden said. I had already missed one bird and was determined to get this one. Must not miss again. Get in the gun, move with the bird, keep moving after the trigger. Time slowed down. The bird was six feet overhead; I swiveled on my heel, focused on the streaking orange collar, the eye, the beak and let him put some distance between us. It was like there was a line between my bead and the bird; I was conscious of the gray shot string coming out of the barrel; the bird folded and tumbled. I remembered my very first Hun, taken on a chukar hunt 13 years before. That bird came from a small hay field close to a creek. We had thought we were finished with for the day when one of the German shorthairs went on point. A handful of birds came up and I knocked one down. The experience taught me a lesson about where these interesting gray partridge live. Sometimes chukar and Huns inhabit the same ground, but often they are neighbors. Chukar hold the high ground, the inhospitable rim rocks, the little patches of cheat, while their partridge cousins prefer wide open spaces in cropland, sage, and bunchgrass country at lower elevations. Look for foothill habitat close to irrigated agricultural lands for the best hunting. After the first hour, Linden put Manny away and let his older dog, Buddy, out of the truck. We worked again the rim rock we had hunted first. Buddy found some scent where we thought there were no birds. He pointed then he pulled back. He walked in a ten-foot square, his nose twitched, his head swiveled side to side, then he locked up again. I walked in, the shot was mine and I missed it. At the end of the morning's effort, I could count four empty hulls and two spent partridges. Linden had his own brace of birds, but he'd expended fewer rounds. We would add to our bag in the afternoon, but nothing was said about getting a limit. Perdix perdix, the grey partridge has an understated beauty with wings of white and mottled brown that allow the bird to hide by holding still. A pastel-grey on the breast blends on the head with shades of brown or orange. Their eyes are surrounded by a pencil-thin border of red. Flanks and breasts are splotched with markings of chocolate. We had one more day to hunt, so I took the evening to scout with my camera. On a gravel road I ran into the cowboy again and asked him to tell me a little bit more about the birds. I could tell he knew a little about cows and horses, a little about people, but I guessed he liked this bird imported from Hungary better probably than all three. We heard the partridge call at dusk. Kieerr-ikk. Kieerr-ikk. "That's their call," he said. He said he'd have time to bring his springers out to hunt with us in the morning, but he'd leave his shotgun in the shop. In hand, the Hun has an understated beauty. Wings of white and mottled brown allow the bird to hide from predators by holding still. A pastel-grey on the breast blends on the head with shades of brown. Their eyes are surrounded by a pencil-thin border of red. Flanks and breasts are splotched with markings of chocolate brown. We often find the birds in short, light cover. 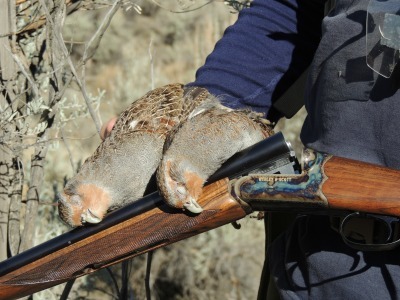 And they are almost always a surprise when we are expecting quail or chukar or a wary old rooster. Huns feed mainly on grains like corn, oats, wheat and barley, but also eat weed seeds and green leaves. They start the day after most of the dew dries off the grass then feed until late morning, loaf in a grassy area until mid-afternoon, then resume feed¬ing until dusk. The birds roost in alfalfa fields, grain stubble, short grass or even on plowed ground. They often form roosting rings. In winter, huns may roost in a depression in the snow, or burrow-roost under it. Coveys normally consist of 10 to 12 birds. Huns do not hold well when first approached. They tend to sneak ahead of a hunter or dog, then burst from cover in unison. The covey remains together. Early in the season, huns fly only a short distance. As the season progresses, they go farther, sometimes over half a mile. Huns are spooky as chukar, faster than quail, and smart enough to run, circle and hide. Thinking back, our second day on that hunt was perhaps the best day of shooting Huns I might ever have. After breakfast we followed the springers over a bridge then locked in both sides of a little creek that wound through the alfalfa fields. As soon as I had the wind in my face I smelled them. I'd never smelled the birds before, but I knew what they were. They were close and then the springers were in amongst them and I shot a double, one going up the creek and the other across the stubble. I finished the drive with five Huns and a rooster pheasant.